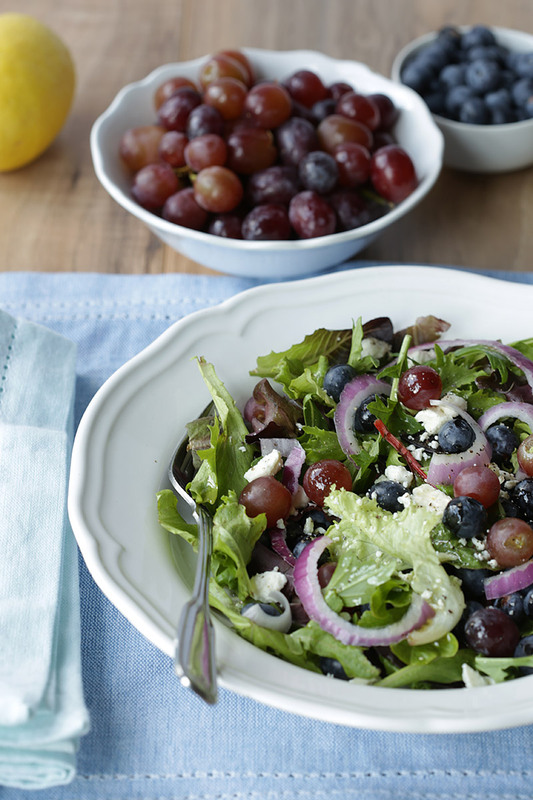 This blueberry salad combines two of my favorite fruits, blueberries and red grapes. I love the way their sweet flavors mix with the tangy feta cheese and the spicy red onion. I also love that the dressing is light: a bit of olive oil, honey, fresh squeezed lemon juice, and cracked black pepper. I always leave out vinegar so the different flavors will really stand out. I think this is a perfect salad for lunch or dinner, any time of the year. My favorite way to eat it is outdoors on the patio, with a glass of sparkling water. And my favorite blueberries are the ones I grow in my garden each summer! If you haven’t tried growing them, I highly recommend it–as long as you have a yard that gets at least six hours of full sun per day. They’re pretty much maintenance-free, but you cover them with netting to keep the birds from eating them. That’s no biggie, and it’s well worth it. To find out just how easy it is to grow them, you can follow my simple instructions. Then you can just wander outside in summer, pick the blueberries, and pop them in your bowl (and mouth!). Here’s the blueberry salad recipe — I hope you enjoy it! Rinse the mixed greens and arrange them on a plate. Layer the fruit, with the onions and cheese on top. Toss with the dressing and crack the black pepper on top. Adapted from a recipe by Lemon Tree Dwelling. Do you have a great blueberry salad recipe? Please let me know in the comments below.